U.S. authorities approve the technical solution for vehicles with 3.0-litre V6 TDI engines. In Germany, Porsche Cayenne 3.0-litre V6 diesel model vehicles in emissions class Euro 6 will receive a free software update in the workshop starting from calendar week 45. On Monday in the USA, the Volkswagen Group reached an important milestone in the diesel issue: The Environmental Protection Agency (EPA) and the California Air Resources Board (CARB) have approved the technical solution for adjusting emissions (the “Emission Compliant Repair”, or ECR). As a result, more than 38,000 3.0-litre V6 TDI vehicles with “Generation 2.1” and “Generation 2.2” engines can now be brought into line with the emission standards according to which they were originally certified. For Porsche, approximately 11,500 Porsche Cayenne V6 diesel model vehicles are affected in the U.S. Eligible customers will be notified that they can receive the emissions compliant repair free of charge at their preferred authorized Porsche dealer beginning November 6. 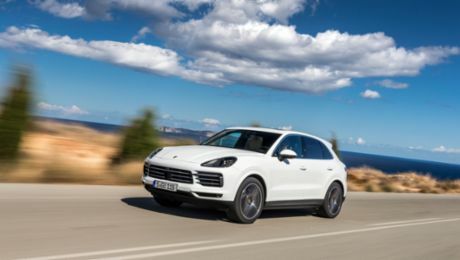 In Germany, Porsche has taken an important step in relation to the recall of the Porsche Cayenne 3.0-litre V6 diesel model vehicles in emissions class Euro 6. The German Federal Motor Transport Authority (Kraftfahrtbundesamt – KBA) has approved the software update submitted by Porsche for the affected models. Porsche is now bringing the affected vehicles in to workshops for the free software update. Customers are expected to receive specific information from their respective Porsche partners from calendar week 45 and will be asked to schedule an appointment at a workshop. The software update takes about an hour at the workshop. If necessary, the Porsche Centre can provide a replacement vehicle for this period. The KBA has confirmed the previous information provided by the manufacturer regarding fuel consumption, maximum engine power, maximum torque, noise and CO2 emissions. Furthermore, the service life of the engine and exhaust after-treatment system will not be negatively affected by the software update. Diesel engines traditionally play a subordinate role at Porsche – the company does not develop or build diesel engines itself. In addition, the demand for Porsche diesel models is falling, whereas interest in hybrid models has risen dramatically. Currently, one in four of new Panamera delivered is a hybrid model. Nevertheless, diesel engines do make an important contribution when it comes to achieving CO2 targets and are set to remain in use at Porsche in the future. Over the course of the next ten years, Porsche plans to offer optimised combustion engines, plug-in hybrid models and purely electric sports cars in parallel. The Cayenne recorded growth of 35 percent. The greatest demand continues to be for the Macan. 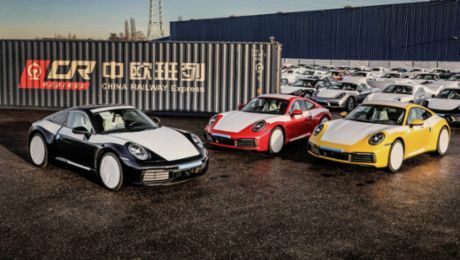 Rail transport on the ‘New Silk Road’: Porsche will use rail transport for its transcontinental logistics.